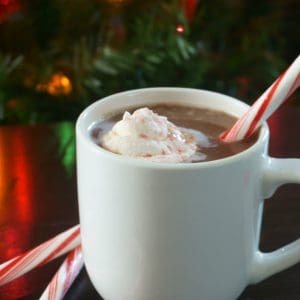 Easy, decadent, yet wholesome, Hot Cocoa complete with Peppermint Whipped Cream. Beat cream until stiff peaks form. (Do not add sugar--hot chocolate is sweet enough.) Transfer cream to a quart size baggie. Snip edge of bag, and pipe out cream onto a cookie sheet lined with parchment paper or wax paper, into the shape of mounds. Alternatively, you can just scoop small tablespoons onto parchment paper. Sprinkle with the crushed peppermint candies and put into freezer until solid (about 1 hour). Whisk together cocoa, salt, and dark chocolate in medium saucepan. Slowly whisk in both milk and maple syrup. Bring to a simmer, whisking occasionally. Once chocolate has completely melted and milk is warmed through, remove from heat and whisk in vanilla extract. You do not need to freeze the whipped cream, but it is so fun to watch the frozen cream melt into the hot chocolate. Plus then you can freeze extra whipped cream to have when the craving for hot chocolate hits. Nutrition values are based on hot chocolate alone made with almond milk.